Use the tabs below to learn more about our training. CICM is the world’s largest recognised credit professional body, and credit and collections is a unique profession. Programmes can be tailored or bespoke to ensure they are relevant to current needs in support of business objectives. Training is delivered to trade and consumer organisations worldwide for an immediate impact on performance. Expert trainers who are specialists in their field, share their knowledge and experiences, tips, tools and techniques to help improve effectiveness of the team. Delivery is designed to meet the needs of all sectors, trade or consumer, using current best practice tools and techniques. CICM assignments are available for a select number of training programmes to support achievement of qualifications. Cost effective training to upskill, motivate and develop knowledge, skills and performance for a maximum of 15 delegates per day. CPD hours are attributed to all training programmes. Contact Julie Dalton, In-company Training Adviser, to discuss your requirements. CICM assignments are available for a select number of training programmes to support achievement of a qualification. Click below for example standard programmes with an overview of content, who it’s for, what you will gain, and what it will cover. Barry, a CICM Fellow, is an experienced trainer and consultant, specialising in credit control and collections. He has held senior roles in a wide range of sectors, improving credit management, customer relations and modernising working practices in many FTSE 250 companies. Cliff has comprehensive experience in both consumer and commercial debt markets. He delivers training and consultancy to a wide range of sectors, including utilities and social housing. He has over 30 years’ experience of the debt collection industry and is a CICM Fellow. Gareth currently leads a commercial debt recovery department, overseeing claims through the courts, litigation and insolvency. Gareth is a CICM Fellow and an experienced trainer delivering to a wide range of commercial clients on legal aspects of credit control, debt recovery and litigation. Jean is a management and training consultant, specialising in strategic planning, implementation, credit risk and finance to an international client base. Jean is also a regular speaker at senior executive events. Jeff is a management and training consultant, specialising in finance, credit risk, commerce and management development. Jeff, a CICM Fellow, delivers training and consultancy to businesses in the UK, EMEA, Far East, Australasia, North America and Russia. Jon is an experienced and successful Operations Director and trainer. Jon delivers various credit management, debt collection and recovery training courses, both consumer and commercial, for private and public sector organisations. Pam is a highly skilled credit management trainer with extensive experience delivering training globally for the credit industry. Pam, a CICM Fellow, has over 15 years of operational credit management experience covering all credit roles. Robert is a solicitor specialising in commercial litigation, credit control and commercial contracts. He is an experienced trainer and delivers training in court procedures, credit control and dispute resolution and insolvency and bankruptcy. Robert also sits as a Deputy District Judge. Tony is a Chartered Management Accountant whose experience includes cost, financial and management accounting in a variety of industries including manufacturing, service and merchant banking. Tony is an experienced trainer and consultant specialising in all aspects of finance and accounting. Collections training programme success for Utilities sector. 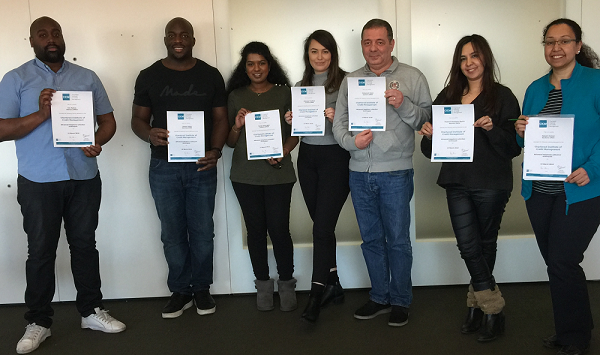 CICM’s expert trainers tailored the programme for United Utilities, which has been a successful start to their corporate membership journey with CICM. The trainers, who are experts in their field, deliver a highly interactive programme using a coaching system to give the opportunity to practice techniques and improve skills. Understand company’s debt collection philosophy and what makes a good collector. Understand what you can and can’t do and why. Know a collection strategy for different types of defaulters. Know how to handle a range of calls to maximise debt collection. Kelly Walker, Collections Manager – Domestic Retail. CICM In-company training can be arranged, covering all areas of credit. Our expert trainers can tailor programmes to focus on key areas for your team and sector. Delivery can be arranged at your offices at a convenient time for you. Telephone collection skills and standards to aim for. Challenging situations and handling queries. Persuasive and positive language – ‘can do’ attitude. Handling non-payment excuses, influencing and negotiating payment. “The course was well delivered and Pam was brilliant at involving every member of the group. I have picked up so many good tips from the course and I am already applying what I learned while chasing customers, thank you”. CICM Training can help build your team’s confidence and skills.